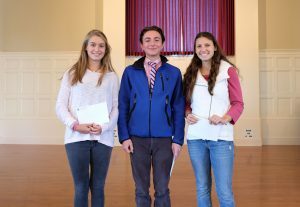 Kudos to seniors Josh Calianos, Anabelle Farnham, and Sophia Schaefer, who were named Commended Students in the 2018 National Merit Scholarship Program. Commended Students placed among the top 50,000 scorers of more than 1.6 million students nationally who took the PSAT. Way to go, scholars!